There are many different ways trading the forex market. In order to make a consistent profit out of trading the financial instrument, you must have a clear understanding of the basics of the forex market. The financial instrument can move in only three possible way. The market generally goes up in an uptrend and goes down making series of lower highs associated with lower lows in the downtrend. But the other types of movement that market can exhibit is the ranging movement. Most of the professional traders make a huge amount of money simply by trading along with the trend. But in order to trade with the trend, you must have a valid trading strategy. In this article, we will teach how to trade a trending market with the Fibonacci retracement tools. The idea behind this trading strategy is very simple and it’s based on Fibonacci series. Professional coders have developed a unique retracement tools based on Fibonacci series. 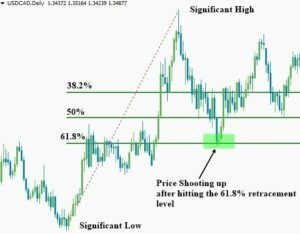 In the eyes of trained professional Fibonacci trading is considered to be one of the most profitable trading strategies in the forex industry. Don’t worry! We will teach you how to use the Fibonacci retracement tools to make the decent profit out of the trending market. What is Fibonacci retracement tools? Trading against the trend is like crossing a river with a hole in your boat. By this simple statement, the importance of trend trading can be easily determined. In an uptrend, the market is not always trending upward rather it’s gradually climbing the invisible stairs with minor retracements. Professional traders enter into the trend with the minor retracement of the price. But how do we identify the end of a retracement? This is where the use of Fibonacci retracement tools becomes handy. Though there are many different retracement levels in the Fibonacci retracement tools but the expert Fibonacci traders only execute their trade in the 38.2%, 50% and 61.8% retracement level of the tools. In an uptrend, professional traders use the most significant low and high of the market to identify the different important Fibonacci retracement levels in the market. Among these three levels, the most important level is the 61.8% retracement level since a retracement greater than 61.8% in the financial market is often considered as the trend change phenomena. Let us see how the professional traders use the Fibonacci retracement tools in their trading. 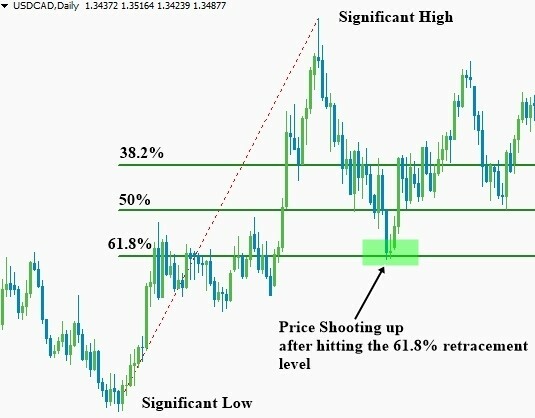 In the above figure, the bullish Fibonacci retracement level has been drawn in the USDCAD daily chart using the most significant low and high of the market. The key support level of the market is considered to be most significant low of the market since price bounces up after hitting that level. On the contrary, the most significant high is the key resistance of the market where the sellers come into action. From the above figure, you can clearly understand that the important Fibonacci levels are the place where the pair might find fresh buying pressure in the market. After hitting the high the pair started its bearish retracement in the market. The first bearish retracement for the pair was the 38.2% retracement level. The second bearish target was the 50 % retracement level and the last bearish target was the 61.8% retracement level. After hitting that level price formed a nice bullish morning star right above the 61.8% retracement level which clearly indicates possible strong bullish momentum in the market. Most of the time price breaks the most recent high after bouncing off the 61.8 % retracement level. Similarly in case of down trend professional traders use the most significant high and low to draw the bearish retracement levels of the pairs. Trading Fibonacci levels with price action confirmation signal. In the above figure, you can clearly see that that two important Fibonacci levels failed to restrict the bearish momentum of the market. So if you have pending long order near the 50% or 38.2% retracement level then you will have a losing trades in the market. So how do we avoid such losing trades while using the Fibonacci retracement tools? The answer is pretty simple. Professional Fibonacci traders use the price action confirmation signal to trade the important Fibonacci retracement levels. In the above figure, no price action confirmation signal was printed near the 50% or 38.2% retracement level so they didn’t execute any trade in favor of the long-term bullish trend. But when the price hit the 61.8 % retracement level it formed a nice bullish morning star which is strong bullish price action confirmation signal. So they entered long in the USDCAD pair by using a tight stop loss just below the tail of the bullish morning star candlestick pattern. Summary: Trading the financial instrument with Fibonacci retracement tools can be extremely profitable if done price action confirmation signals. Professional traders use the highly reliable candlestick pattern to trade the important Fibonacci retracement levels. But if the 61.88% Fibonacci retracement level is breached then we should be aware that possible trend change is going to place in the market. In that case, we will stay on the sideline until the market clearly indicates its next possible move. Though trading with the Fibonacci retracement tools is extremely profitable buts it’s highly imperative to use the longer time frame to draw the important retracement levels on the chart. Experts use the daily and weekly chart to draw the important retracement levels to trade different financial instrument in the forex market. It’s true that the success rate is very in Fibonacci trading but you should always risk a small portion of your trading capital even after getting the possible trade setup in the market.